The practice manager of a leading Teesside law firm has been appointed as the new vice chair of one of the region’s leading business networking organisations. Sharon Hutchinson, practice manager at Stockton-based law firm Endeavour Partnership, was selected for the role at Darlington Business Club by the club’s chair thanks to her varied experience across fields including SME practice, the legal sector and business management. In her new role, Sharon will be focussing on increasing membership and events even further at the popular Darlington Business Club, which was established in in the 80s and has grown to be the largest business network in and around the Darlington area with more than 120 members. The networking organisation meets monthly and holds an annual ‘Business Expo’ event at the Northern Echo Arena in Darlington to showcase dozens of local companies and organisations. This year’s takes place on May 17. 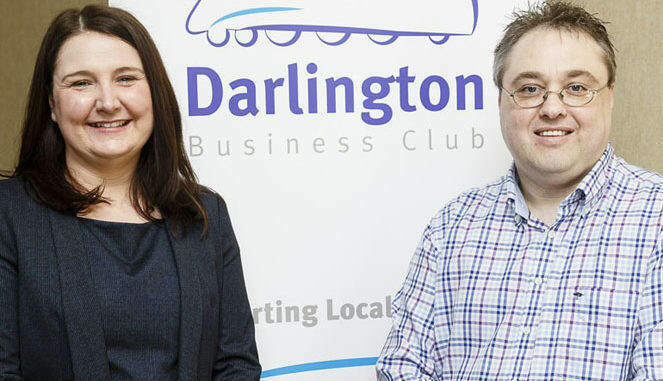 Sharon, pictured (above) with Jayson Gurney, said: “I am really proud to have been appointed to vice chair of Darlington Business Club as it’s my local club supporting an area I am passionate about and have operated in for almost 20 years. I hope to bring a new skillset to the team as we enter an exciting era with plans to double membership. “Darlington and the surrounding area have an exceptionally thriving business community which is constantly growing. Sharon joined Endeavour Partnership in 2014. The Stockton-based legal firm employs a team of 54 and has a reputation spanning over 17 years, providing high quality advice on a range of business law matters including mergers and acquisitions, intellectual property, employment, commercial property and corporate recovery and insolvency from its headquarters at Teesdale.